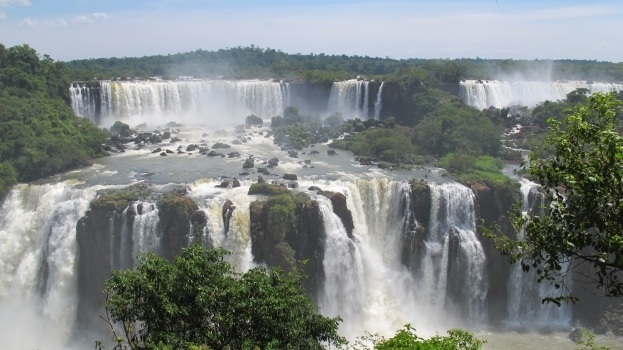 Mind-blowing nature is South America’s forte, and Iguazu Falls, which straddles the border of Argentina, Brazil and Paraguay, is arguably the continent’s most gob-smacking offering. 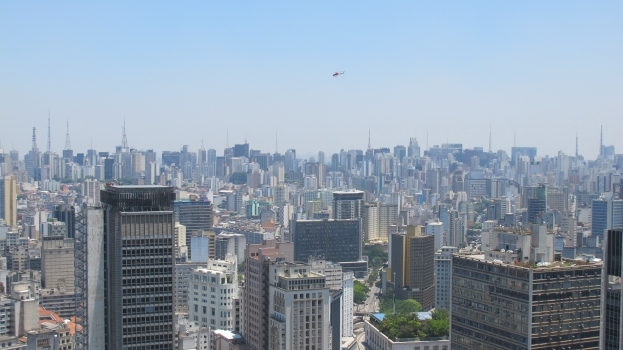 Flying there is often cheaper than the long distance buses from Brazil’s main cities, but since forward-planning isn’t our strong-suit, we had to settle for a 16-hour trip from Sao Paulo, Brazil’s behemoth financial hub. 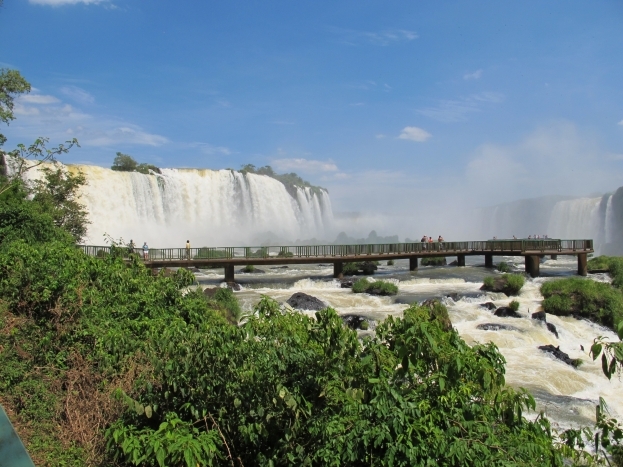 We’d been told you have to see the Falls from both the Brazilian and Argentinian sides, so we spent our first afternoon in town checking out the Brazil side. If you’re staying in Brazil, it’s an easy 30 minute public bus ride (route 120) from town to the park. There you pay the entrance fee (approximately AU$20), then hop aboard a bus that takes you through the national park to the Falls viewing area. The bus stops at a number of spots where you can sign up for hikes or boat rides, but being pressed for time, we stayed on until stop three for a 1.5km walk that offers majestic views of the glorious waterfall. It’s difficult to describe how huge these waterfalls are. 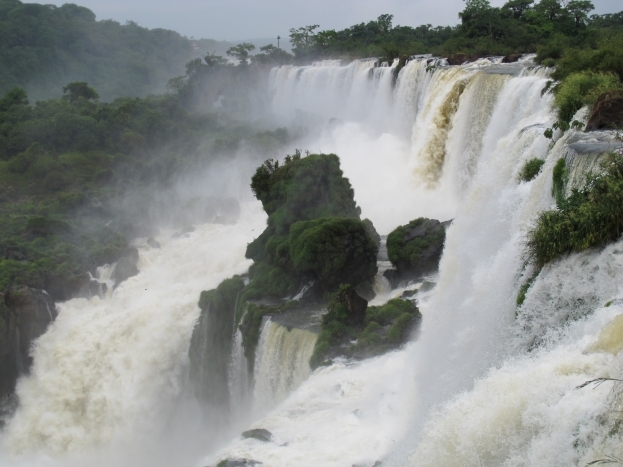 Your first sighting is gob-smacking and as you walk along the trail, you come across countless other waterfalls that all descend from the Iguazu River. The trail ends with a walkway that takes you close to the “Devil’s throat”, one of the biggest falls. Feeling the water spray on your face is the perfect antidote to a hot day walking. While Brazil offers a panoramic glimpse, the Argentine side allows you to get much closer to the action. Again, you pay about AU$20 to enter, then jump on an open train that drops you at various walking tracks along the upper lip of the Fall. They’ve built a great network of trails that allow you to see and hear the water crashing beneath you. 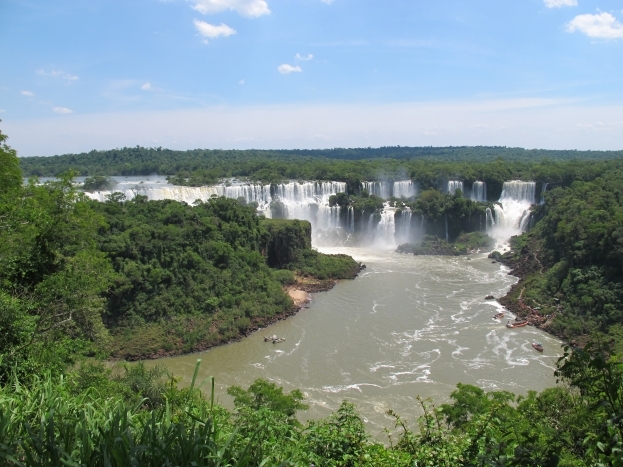 Travel tip: If you’re staying on the Brazillian side, allow an entire day to cross to Argentina, as you need to stop at the border for entry and exit immigration stamps on each journey, which can be a time-consuming process. It’s not a long distance, but it took us about two hours to travel about each way thanks to the continual stops.